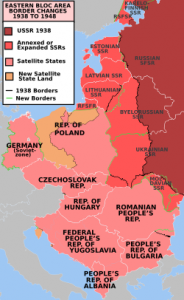 Eastern European borders have changed over the years. An ancestral town may have been under the rule of several countries over the period when our relatives resided there. Recognizing what government was in control at various times can help in understanding the environment in which they lived, events that stimulated migration, languages in which records were kept, and likely locations where these records might be found. Understanding changing — and often relentless — government hostility towards the Jewish population can provide perspective on our ancestors’ experiences. This overview of Eastern European border changes from the time of the Khazars, more than 1,000 years ago, to the present day, will provide a context to influence your own research. Speaker: Hal Bookbinder is a former president of the International Association of Jewish Genealogical Societies, and is current JGSLA board member. He has been researching his family for over 20 years, tracing two lines into the mid-18th century and identifying over 3,000 relatives. He has published numerous articles on Jewish genealogy and contributed to several comprehensive volumes on the subject. In the world beyond genealogy, Hal directs computing for UCLA Healthcare and teaches Information Technology at the university level. JGSLA Members free. $5.00 for guest. Refreshments will be served.